BlackBerry reported its fiscal first quarter 2018 earnings this morning, and as the company continues to focus on the "Enterprise of Things" and cybersecurity, it was able to report a profit for the period. Under GAAP (certain accounting rules), BlackBerry reported a profit of $1.23 per share vs. a loss during last year's fiscal Q1 of $1.28 a share. On a GAAP basis, the company had revenue of $235 million for the three months ended in May. $160 million of that amount came from sales of software and services. Under GAAP, BlackBerry had gross margins of 64%, and ended the three months with $2.6 billion in cash. During the quarter, BlackBerry started shipping two handsets under two different licensing agreements. 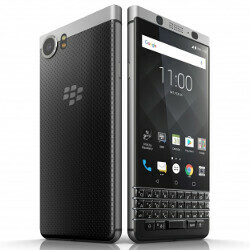 The BlackBerry KEYone, manufactured by TCL, features a physical QWERTY keyboard and offers exceptionally long battery life. The phone has generally received good reviews and we scored it 8.5 out of 10 (read our review by clicking here). Also launched during the three months was the BlackBerry Aurora. Produced under a licensing deal that BlackBerry signed with BB Merah Putih, this low-to-mid range handset is manufactured and sold in Indonesia. Other highlights during the quarter include the launch of BlackBerry SHIELD, a tool that allows companies to determine how protected they are from cybersecurity risks. The company also received $940 million from Qualcomm after a dispute was settled under binding arbitration. "Our financial foundation is solid. We reported non-GAAP profitability for the third consecutive quarter, and our balance sheet continues to strengthen. More importantly, we are better positioned to invest in our strategic areas of focus to drive long-term sustainable growth, while returning capital through share repurchases to further enhance shareholder value. It certainly appears as though BlackBerry has turned the corner, and while handsets are no longer the focus of the company, CEO John Chen has the company competitive in the Enterprise software business. After the quarter ended, BlackBerry was named a "Leader" in Gartner's Magic Quadrant for Enterprise Mobile Management Suites. BlackBerry shifting to a software and services company, while putting licensing agreements in place with other OEM's to build BlackBerry branded hardware while they supply the software and security, was definitely the right move. Kudos to John Chen and company on their performance this quarter. Looking forward to seeing more in the way of profitability as the fiscal year progresses. Right and I guess we are supposed to ignore profits from their handsets, if they have any to begin with. Right, and I guess we're supposed to ignore the fact that you're in so much pain and can't accept the fact that BlackBerry no longer builds handsets to begin with. Join us in the present now. Why don't you just join us outside of Denialville. You're the one who is clearly in pain over the truth. Why don't you come off the corner of btching and moaning in that little town called whinersville? And while you're at it, please show us on the doll where BlackBerry has touched you. Isn't that what you dis before you were banned? Well we both know you like to shove BlackBerry phones up your rear. No, it's what you did every time you were limited, it's what you still do now, and it's why I made you deactivate your mxyzptlk account. We both know that you're the idiot from the article that married his iPhone. And you're the one who continues to show mad love to his blackberry. And I forced you to admit that the KeyONE has a flaw. Your responses are getting more lame with each comment you make. You really aren't a challenge. Now stop making up stories because I made you deactivate your mxyzptlk and tony_stark accounts. You talk as if your canned responses are any better. Spoiler alert: They aren't. I made you admit that your favorite OEM released a flawed device that you couldn't deny or go back on. EOS. Lol, stop deflecting from the fact that I got in your head so much that I forced you to deactivate two troll accounts and made you acknowledge that your deity Apple has flaws. You forced no one to do anything. Now I forced you to admit that your keyone has a design flaw. I don't own a KEYone as of yet, so you're comment is false. But don't let the facts get in the way of your fabrication because I made you deactivate your tony_stark and mxyzptlk accounts. Lol, MG has been served. Lying for the guy you're dckriding will only get you more dck to ride, it won't make what you're saying a fact. T-mo customer here with the ability to JUMP! to a new handset with minimal cash outlay. My current flagship is on life support (chained to the wall charger & suffering from lag) so release this now to the carriers and likely, they'll see an uptick (albeit slight) in interest. We are all aware that this is not for those who consume a ton of media, but messaging maniacs como yo would like to give this a chance. Long lasting battery life? Bring it on. I'm going to run Adguard and a VPN in the background, so show me whatcha got. That is all. I was at work yesterday and saw a gentleman using a phone with a physical keyboard. Right away I knew it was a blackberry. Lo and behold. It was a Keyone. Good job BB. I've been seeing more and more KEYone's here in NYC. well then you might have to add me to that roster then. I used my BlackBerry Tour for a long time before jumping onto Androdi with the Droid X and even then still kept my Blackberry as a work device until 2012. Very cool! I haven't seen one in real life yet. Your chances of seeing one outside of a major metro area is pretty slim. Perchance it was in stock at the store, I picked my KEYone at Best Buy today! Good news that Blackberry will be around to support it. BlackBerry makes a profit off their services. You don't need an over exaggerated comment to tell you that. You're absolutely right. As you can see, lol. The pain of denial in your comment is evident. So says the mayor of Denialville.